Here's an example of the kinds of old buildings along Ouray County Road 31. I believe this is the Guston Mine. Many of these structures have been "stabilized" for conservation. Enter them at your own risk. 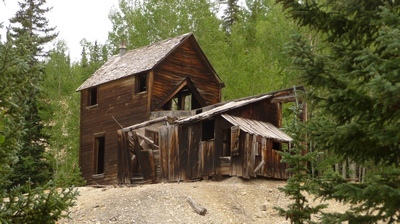 Here’s a nice romp through history—a beginner+ road and some cool old mining structures. 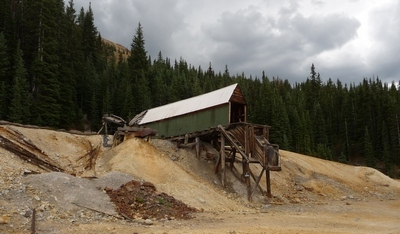 Take a ride through the historic Red Mountain Mining District! 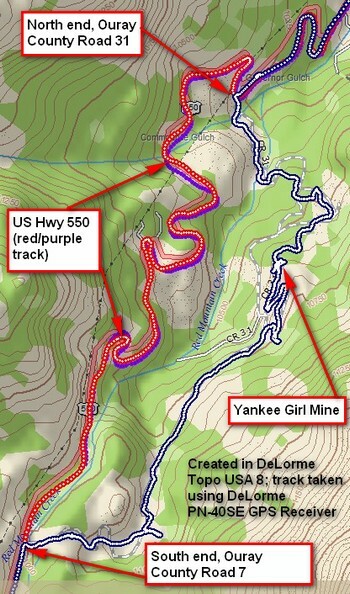 Note: The Yankee Girl Mine, which is on this road, is so iconic I’ve featured it in its own post, which you can read here. Coming from Ouray, County Road 31 can be a little hard to locate. I’m providing a GPS track, a photo of the entrance, and directions. Here are the directions: Travel south on US Hwy 550 and pass through Ironton Park (the high hanging valley). The road then winds up. The second sharp switchback is the one you want. It’s the one with the high-tension electrical wires overhead. There’s a tiny green sign that marks the entrance to the north end of the county road. Here's the view you want to see as you travel south on US Hwy 550. Note the electrical wires overhead. This is the second switchback after Ironton Park. The county road starts right at the first apex of the switchback. This is a loader. Rock is pushed in on top and tumbles down into the railroad car. Of course, the railroad is long gone. Turn onto the road and you’ll see the sign more clearly. The road is dirt and in the spring is impassible. I drove it July 24th and it was quite dry and easily traversable. There is no scree to speak of. Parts of the road follow the old railroad grade that used to haul the ore out up over Red Mountain Pass, so these parts are gently sloped. Other parts of the road are a bit steeper. There are some ruts here and there. You’ll cross over two small bridges so that you’ll be on the east side of the Uncompahgre River. The road winds back and forth quite a bit. It can be hard to decide which way the road goes because there are so many short side roads. The following photo shows how dramatic the scenery can be. 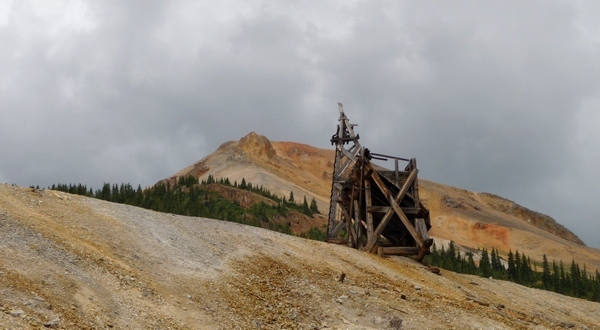 The photo looks sharply up across the tailings pile to a head frame, which held the pulley for the ore car. That’s one of the Red Mountains behind. This looks sharply up the hill from the county road at an abandoned head frame. That's one of the three Red Mountains in the background. Here's the GPS track. Note that it does not align with the underlying base map. The base map is wrong and the track (blue) comes much closer to representing ground truth. This entry was posted in GPS Tracks, Motorcycling, Ouray County and tagged Colorado, CR 31, dirt bikes, Guston Mine, ouray county, Red Mountain, Red Mountain Mining District. Bookmark the permalink. Rick, thanks for the directions. 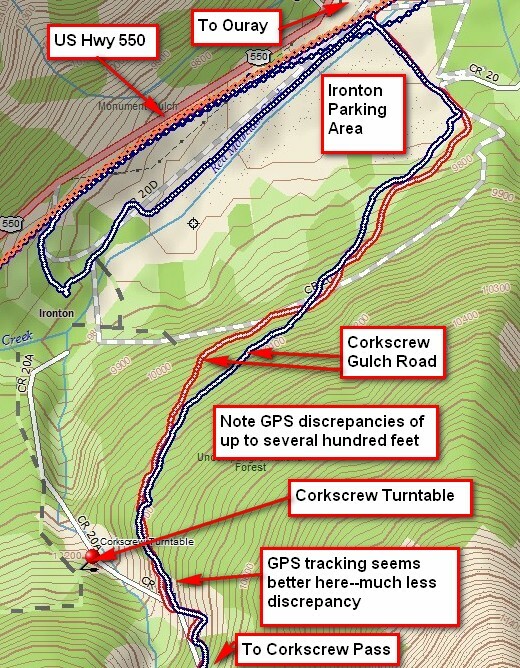 I’ve also done some figuring based on maps and aerial photos; it looks as though the site is a few hundred yard walk from Corkscrew Gulch Road as shown in the map below. And…I hope nothing on this site advocates riding off the trail! I am a firm believer in staying on the trail and following the rules that the Forest Service, BLM, etc., put out for a given road. If the trail from CR 31 is marked as foot travel only, then motorcycles should stay off. If, however, it is marked for motorcycles, then in the Forest Service’s judgment, that’s okay. I also have made it abundantly clear in my posts that old structures are dangerous and should be shown the utmost respect. We visited the turntable this summer and it is truly historic and awesome. While it may be possible to get a 2 wheeler over the road bed, that would be a really bad thing to do. This is National Historic Site territory and to disturb it with a motorcycle would be very destructive. Besides, the short walk (< than 1 mile) is scenic and very interesting. There are two jumping off places for the trail. 1. Guston/Cora Belle mine tailings. From the north entrance to County 31 off of 550. drive a little less than a mile and the old mine buildings and tailings will be on the left. You can turn left off of 31 and drive out on the tailings and can start from there. There is a concrete drainage ditch all along your right. Facing the ditch and looking left, you will be able to see a cut and the old roadbed heading on north about 100 yds (or 200) down the hill across the ditch. There will be some trees growing in the roadbed but it is there. This is the spur of the Silverton RR which served this complex. Following this road bed for a few hundred yds will bring you to a 2-track road heading north/south. Head north…the road will end and the old roadbed will begin…..Total length will 1 mile or so. 2 Instead of turning onto the tailings, you can proceed on 31 up the hill and turn left off of 31. This will be the road mentioned above and you will be driving about 50-100 feet above and past the tailings mentioned above and can go until the road ends, then begin your walk. This will save a couple tenths of a mile off the walk. There are several turnoffs and other intersections on this road and you generally go left….you will have to follow your nose to the end. Remember, this is an old roadbed and the grade will never exceed 4-5%. Henry, thanks for your comment. Regarding taking your 4WD pickup on Ouray County Road 31, the answer is yes, most definitely. I would note that there are some sections that are a bit narrow. Regarding the old railroad turntable, I don’t know. I’ll have to look into that. Very cool website. Do you think I can take this road, (Ouray # 31) with my four wheel drive pickup? My girlfriend is the original “Yankee Girl” We have photographed the head frame from the highway, and I have seen people in Jeeps over there, but never knew how to get there. Thank you. We will be going through there on Friday, but can’t take the Motorcycle and we both want to check it out. Also, do you know if you can still ride a motorcycle to the north of your map to the old turntable for the railroad? I looked for it on your website, but didn’t see it. If you are ever in Lake City, look us up.